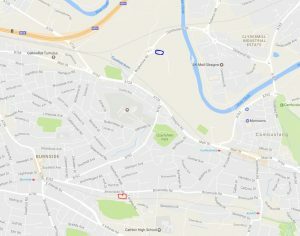 to those who have entered, enjoy the day I hope the weather is kind, and remember arrive in good time at the Rugby and sports club (G72 8HG) as the start/fininsh is a gentle 1 mile jog away. there is no parking at the start/finish. 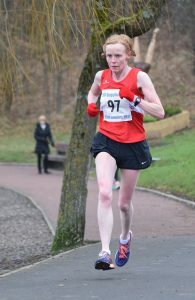 Cambuslang Harriers successfully retained their M40 and M50 team titles at Dundee on 28th January. 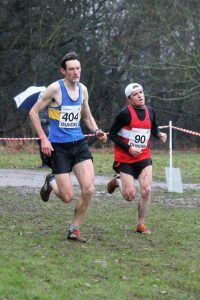 The odds for the M40s holding onto their team title were not favourable with the first 3 runners in last year’s championship, Kenny Campbell, Kerry-Liam Wilson and Jamie Reid unavailable due to injury and in the case of Kerry-Liam an accident sustained at work a few days previously. In addition, 2016 4th counter Greg Hastie was also ruled out. 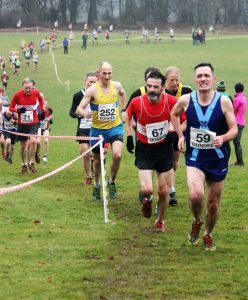 However, determined running and excellent team spirit saw Robert Gilroy 2nd, Frank McGowan 14th, Justin Carter 21st and M55 Colin Donnelly 23rd pip Corstorphine on count back. Both teams tied on 60 points but our last counter had finished ahead of their last counter. It was fitting that Frank for getting back into shape after a debilitating injury and Justin for his recent consistent performances should share in this team triumph. Our 5th finisher M50 Stan MacKenzie played his part too in the M40 team victory by also finishing ahead of their last counter. While not being a counter for the M40 team Stan had the satisfaction of leading the M50 team to a decisive victory with strong support from M60 Eddie Stewart and fellow M50 Chris Upson. These 2 team victories continued Cambuslang’s long run of team success in this competition. 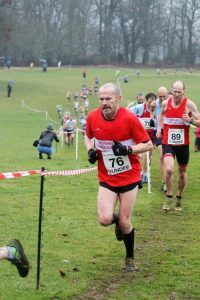 The over 40s have amassed 17 gold, 7 silver and 3 bronze over the last 30 years while the over 50s have won that age category on 6 out of 7 possible occasions since its inception. Cambuslang were also rewarded with a number of individual medals across the age groups. Robert was just pipped for the M40 gold in the sprint to the line by new master Jethro Lennox of Shettleston. Stan won M50 bronze and Colin D M55 gold having previously won titles in the M40/45/50 age groups. 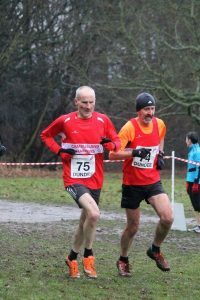 It was encouraging to see Colin continue his comeback after a persistent knee problem. Eddie actually went one better than Colin in lifting the M60 title to add to his earlier wins across the 40/45/50/55 age groups. His journey from Prague was therefore worthwhile. When at his peak and a Scottish internationalist Eddie was always a light trainer averaging only 30 miles a week. Nowadays he only runs 3 days a week but he reckons his active job as a gardener supplements his training. Paul Thompson and Frank Hurley were worthy silver and bronze medallists in the M60 category. The club fielded a ladies team in this event for the first time and Jennifer Reid, Bernie O’Neil and Claire Mennie finished a very creditable 5th in the team event. 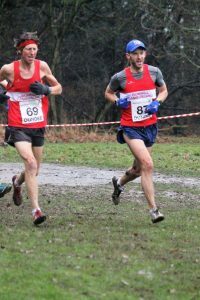 Alongside the ladies M65 runners Peter Ogden and Iain Burke gave good accounts of themselves. The club was well represented in the M40 to 60 event with the finishing order of our runners not already mentioned as follows Johnny MacNamara, Brian Douglas, Michael Barker, Alick Walkinshaw, Dave Thom, Mick O’Hagan, Tony McCutcheon, Colin Feechan, Scott Hunter and Frankie Barton. Colin F deserves thanks for combining the double role of team manager and competitor which is not an easy task when you have 24 runners taking part. The assistance Kenny gave to Colin was also appreciated. It was however unfortunate, that Kenny could only watch from the sidelines and not have the chance to defend his M40 title. 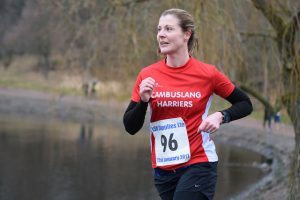 In spite of a number of late changes due to injuries the Cambuslang Harriers M35 and M50 teams managed to win their respective age groups while the W35 team finished a creditable 5th. After finishing a close 2nd on the opening leg thanks to Gordon Robertson (19.05), Iain Reid‘s 18.57 clocking took the club into the lead. 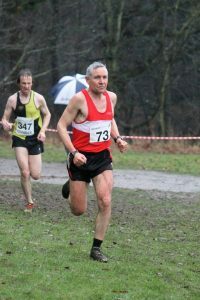 Ben Hukins (19.27), the day after his hill relay, extended the lead to give Robert Gilroy the glory leg. 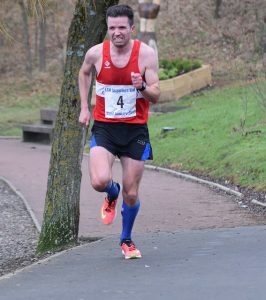 Robert’s time of 18.40 was the fastest of the day to give Cambuslang a commanding victory of almost 4 minutes over new club PHRC. The M50 team of Des Dickson (21.26), Colin Feechan (21.36), Dave Thom (21.57) and Chris Upson (20.49) were tested more with Shettleston just behind them going into the last leg. However, in spite of Chris still having the previous day’s hill run in his legs he opened up a decisive gap over our local Lanarkshire rivals. Our ladies trio of Bernie O’Neil (24.11), Erica Christie (25.00) and Jennifer Reid 23.50 combined well to achieve 5th place in a highly competitive ladies’ competition. 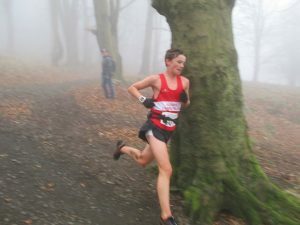 The ladies B team’s times were very close together with Claire Mennie recording 26.03, Julie Dell 26.04 and Lyn Angley 26.13 to give them a 10th place finish. There were many other good performances from the club with the B M35 team of Frank McGowan, Brian Douglas, Paul Kernohan and Justin Carter and the M50 team of Alick Walkinshaw, Frank Hurley, Dan O'Connell and Eddie Carr being the first B teams in their age groups over the line. The other 2 full teams of Michael Barker, Brian Campbell, Simon Gold and Mick O'Hagan along with Shaz Hakeem, Scott Hunter, John Kelly and David Stirling also competed well while due to the call offs Iain Burke had no one to hand over to after his first leg run. Apart from having a good turnout of runners it was also encouraging to have numerous supporters including a number of our younger runners to cheer on the “old yins”. Many thanks again to Colin Stephen who captured all our runners in action. 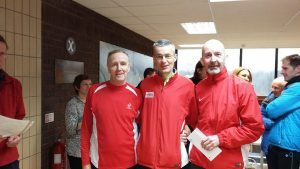 Cambuslang Harriers took part for the second time only in the Devil Burden’s Hill Relay held at Falkland on the 21st January and were rewarded with an excellent 3rd place behind the more experienced hill running clubs of Shettleston and HBT. Although there are only 4 stages 6 runners are required as the two middle legs are run in pairs. 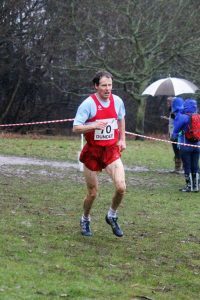 Team manager Chris Upson managed to put together a team in spite of pre race doubts about a few runners due to injuries, colds and travel plans. Chris elected to do the opening leg of 7.5K with 220m of ascent and brought the club home in a very respectable 8th place. Alasdair Campbell and Ben Hukins ran strongly in the misty conditions to pull in a few places running the 3rd fastest stage time for the 10k/680m leg. 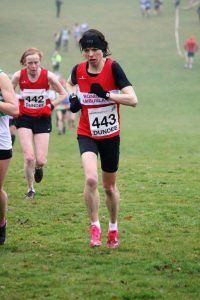 Alasdair had recently shown good form on the hills in finishing 3rd from a strong field in the Tinto Hill race while Ben has had a successful summer trail running season. 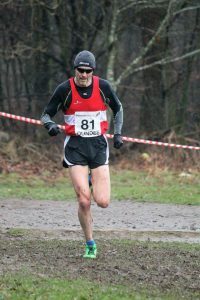 They handed over to former club captain Iain MacCorquodale whose recent training and racing have been severely curtailed due to injury and to Colin Donnelly, multi hill running champion at Scottish, UK, European and World senior and master levels. Unfortunately Colin too has been recently sidelined due to injury and on the day was suffering from a heavy cold. Nevertheless, they stuck manfully to their task over the longest stage of 11.5k with 410m of ascent to give our final team member the chance to chase the teams immediately in front. Joshua Boyle, although still an under 17 athlete has twice represented the UK U20 hill running team, ran a storming leg over 5K/390m to bring the club home in a surprise 3rd place. This was a remarkable run by Joshua as he had only returned the day before from Dubai and then had driven up with his parents James and Helen from their home in the north of England on the morning of the race. Great team commitment and excellent organisation by Chris had been duly rewarded. 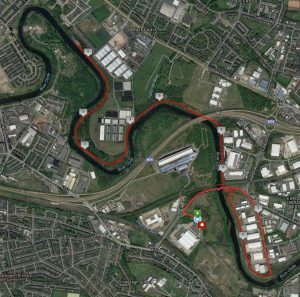 However, both Chris and Ben now had the masters’ road relay around Strathclyde Park to face the next day which would test their powers of recovery.